You never know when a sudden rainstorm might threaten to ruin your family's summer road trip. 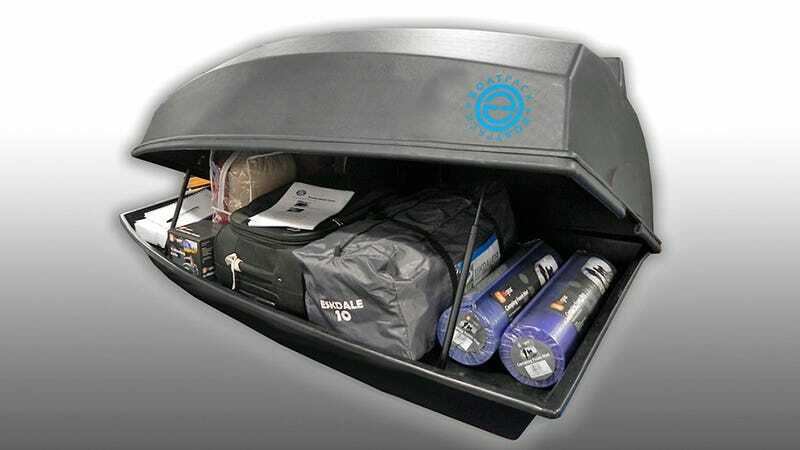 And in the event that flash flooding leaves your vehicle stranded in a quickly rising tide, you'll be glad your luggage is packed away in the multi-function BoatPack which transforms into an emergency dinghy. With a maximum supported weight of around 360 pounds the BoatPack should easily support two adult passengers while remaining seaworthy. And the included wooden seat and folding oars won't waste the BoatPack's spacious cargo capacity so you can still cram a vacation's worth of stuff in there. At almost $1,600 it's considerably more expensive than a similar-sized dedicated rooftop cargo carrier, but, when your GPS' poor directions lead you into a lake, you'll be glad you spent the extra money as you row back to shore.